Brutal killers David Sweat and Richard Matt escaped from New York's largest maximum-security prison, triggering one of the most intense domestic manhunts in years. An argument regularly advanced by opponents of the death penalty is that incapacitation doesn't require execution. Life imprisonment without parole is sufficient, they say: Put the most dangerous murderers behind bars and keep them there forever. But "lock 'em up and throw away the key" is a delusion. Life without parole is no replacement for the death penalty when it comes to protecting innocent lives. Understandably, many find it reassuring to believe that there is a way to protect the public from the worst killers without requiring the state to kill. National surveys find a preference for locking up murderers for life. In the most recent, a Quinnipiac University poll released in June, 48 percent of respondents said a person convicted of murder should be sentenced to life without parole; only 43 percent preferred death. But the last few weeks have provided vivid reminders that life sentences and high-security cells are no guarantee that deadly criminals have been removed from society for good. When Richard Matt and David Sweat escaped from the Clinton Correctional Facility in Dannemora, N.Y., on June 6, they triggered one of the most intense domestic manhunts in years. "Little Siberia," as Dannemora is nicknamed, is the largest maximum-security prison in New York  just the sort of impregnable vault intended to neutralize any possible future threat from remorseless sociopaths. Sweat had been sentenced to life without parole for the 2002 murder of Sheriff's Deputy Kevin Tarsia, whom he shot 22 times and ran over twice with his car. Matt got 25-to-life for torturing to death an elderly businessman, William Rickerson, then cutting up his body with a hacksaw. By grace and good fortune, the fugitives were found before they could hurt or kill any new victims. But residents of northern New York had spent three nightmarish weeks on edge. They had reason to be unnerved: A startling number of murders are committed by criminals previously convicted of homicide. According to the Bureau of Justice Statistics, 1 out of every 11 killers now on death row had already been found guilty of one or more killings before committing the murder for which they were sentenced to die. At least 30 of the 3,000 current death-row inmates were prison escapees when they committed capital murder. We can lock our most vicious killers behind bars, but some will find a way to get out  and some of them will kill again. This week came word of an even more brazen jailbreak: Drug mobster Joaquin "El Chapo" Guzman, one of the world's most notorious criminals, broke out of Mexico's Altiplano, a "supermax" prison from which escape was considered impossible. Shockingly, this was the second time that Guzman, a narcotrafficker charged with numerous assassinations and acts of torture, had escaped a maximum-security prison. Perhaps he too will be captured or killed before he strikes again, but the last time he broke out he evaded arrest for 13 years. 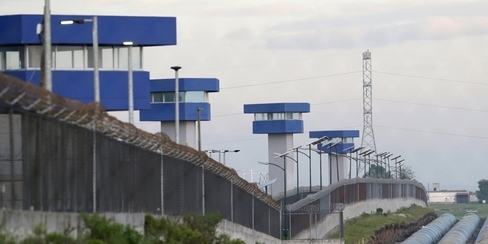 The perimeter of the Altiplano penitentiary on the outskirts of Mexico City, where drug gangster Joaquin "El Chapo" Guzman escaped on July 12, was believed to be so secure that flight was impossible. Guzman, one of the world's most deadly criminals, remains at large. Even behind the bars of an ultrasecure facility, convicted murderers can pose a lethal danger. Matt, Sweat, and Guzman had helpers on the inside and outside who facilitated their escape. Lifers may have followers prepared to carry out their orders and kill on their behalf. They may convince a governor or president to grant them clemency, or persuade some judge, someday, to order their release. And, of course, they may kill behind bars. Massachusetts murderer Joseph Druce was already serving a life term in a maximum-security prison when he murdered fellow inmate John Geoghan, a former priest imprisoned for sexually molesting a child. No living murderer is ever irrevocably incapacitated. Justice may not always require a killer's execution. But when it does, life without parole is an inadequate, and dangerous, substitute.